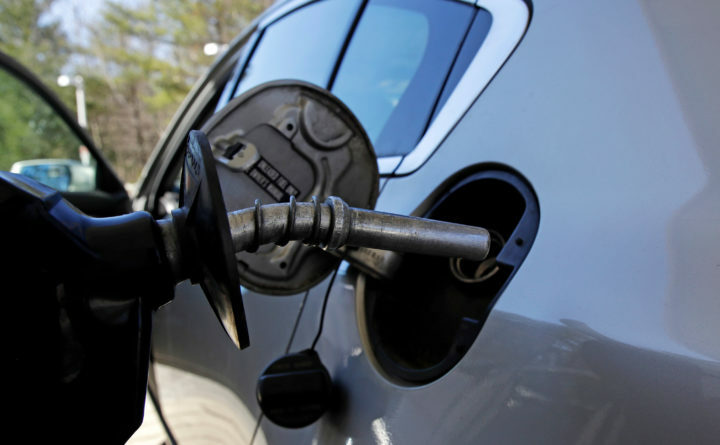 A car is filled with gasoline at a station in Windham, New Hampshire, April 23, 2018. Conserving oil is no longer an economic imperative for the U.S., the Trump administration declares in a major new policy statement that threatens to undermine decades of government campaigns for gas-thrifty cars and other conservation programs. WASHINGTON — Conserving oil is no longer an economic imperative for the U.S., the Trump administration declared in a major new policy statement that threatens to undermine decades of government campaigns for gas-thrifty cars and other conservation programs. President Donald Trump has questioned the existence of climate change, embraced the notion of “energy dominance” as a national goal, and called for easing what he calls burdensome regulation of oil, gas and coal, including repealing the Obama era Clean Power Plan. “It’s like saying, ‘I’m a big old fat guy, and food prices have dropped — it’s time to start eating again,'” said Tom Kloza, longtime oil analyst with the Maryland-based Oil Price Information Service. The proposal eventually would increase U.S. oil consumption by 500,000 barrels a day, the administration says. While Trump officials say the freeze would improve highway safety, documents released this month showed senior Environmental Protection Agency staffers calculate the administration’s move would actually increase highway deaths. Bill Wehrum, assistant administration of the EPA’s Office of Air and Radiation, spoke dismissively of electric cars — a young industry supported financially by the federal government and many states — this month in a call with reporters announcing the mileage freeze proposal. “People just don’t want to buy them,” the EPA official said. In June, for instance, the American Petroleum Institute and other industries wrote eight governors, promoting the dominance of the internal-combustion engine and questioning their states’ incentives to consumers for electric cars. Surging U.S. and gas production has brought on “energy security and abundance,” Frank Macchiarola, a group director of the American Petroleum Institute trade association, told reporters last week, in a telephone call dedicated to urging scrapping or overhauling of one U.S. program for biofuels. Thanks partly to increased production, “that pillar has really been rendered essentially moot,” he said.